Framlingham is without a doubt one of East Anglia's most attractive small towns. The main street starts in the old market place and runs northwards to the castle keep, and there sits East Anglia's biggest castle. Across the lake you can see the red brick Victorian grandeur of Framlingham College, a public school, and hafway along the main street is another grandeur, that of St Michael's church. True, the town is not as busy as Woodbridge, and doesn't have the same range of shops, but then Woodbridge is full of the kind of people who would live in a place like Woodbridge, which I always find a bit off-putting. There is no other Suffolk church quite like St Michael. Suffolk is famous for its naves, but the nave here is almost hidden, squeezed between the huge chancel, longer and wider than the nave to which it is attached, the great tower, and two ornate aisles. The pretty clerestory peeps up in the middle, as if the nave were standing on tip-toe to take a look at the outside world. .
Wills specialist Simon Cotton noted that quite a few bequests in the last years of the 15th century left money for the tower, although there is evidence that it hadn't been started by 1500. This means it must have been built pretty much in one campaign, the battlements topping it out on the very eve of the Reformation. But it is the chancel that makes St Michael an extraordinary church. Whereas at Lavenham, Long Melford and elsewhere, the churches were rebuilt by the new money of 15th century industrial Suffolk as great spaces for public piety, here the rebuilding was effectively an expedient measure for a landed family. The Howards, the Dukes of Norfolk, residents of the nearby castle, lost their family mausoleum at Thetford Priory to the dissolution of the monasteries in the 1530s. They built the great chancel here as a new one, to be their final resting place for generations to come. It wasn't finished until 1554, after the brief but militantly protestant intervention of Edward VI's reign, when Mary I seemed to have brought some stability to the English church again. In these turbulent years of the mid-Sixteenth Century, they had backed Catholic Mary's claim to the throne against that of the protestant Lady Jane Grey and seemed, for a brief while, to have chosen the winning side. However, when Mary died just five short years after her accession and Catholic England was lost forever, their patronage was not forgotten. The Howards retired, licking their wounds, to their other castle at Arundel in Sussex, leaving the new Church of England a fascinating document of how the Reformation years affected a great landed family, a moment frozen in time. Framlingham's Catholic community today meet in the nearby parish church of St Clare, a bare shadow of this former glory, although, ironically, their great Cathedral at Norwich was built by a direct descendant of the Howards. I hadn't been to St Michael for years. 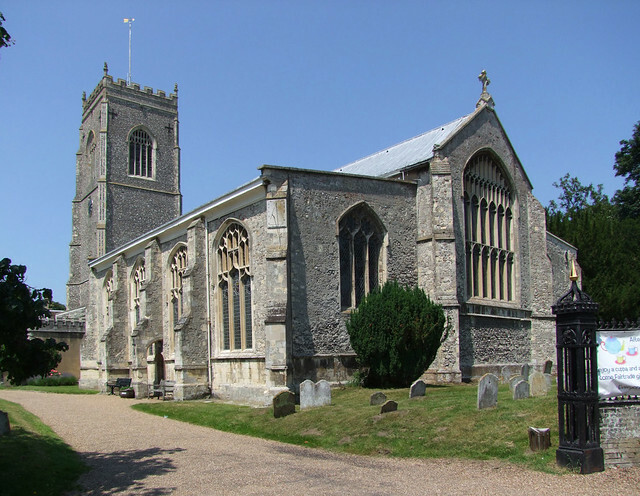 I was often in Framlingham, stopping for a rest in the pub during a bike ride or cycling through into the quiet low hills to the north, but in the summer of 2013 I made my first visit since recording a piece inside the church for BBC Radio Suffolk some seven years earlier. It was the hottest day of the year, and the roads were nearly empty, because I had set off from Ipswich as Andy Murray prepared to try and become the first home tennis player to win the Wimbledon championships for nearly eighty years. Everyone was indoors with the curtains closed, away from the heavy heat, slumped in front of their screens. The only raucous noise came from occasional pubs as I passed. It was a pleasant ride, and even more peasant to sit on the bench outside the church and eat a late lunch, the south side of the building taking the full force of the sun. I lazed for a while and then walked westwards, stepping down into the cool, large porch and into the body of the church. The first impression is that everything is neat and orderly, beautifully kept and cared for. The north door opposite was also open, and white light spilled across the west end of the nave, making everything else dark. It took my eyes a moment to adjust. I looked up through the gloom to see the wall painting of the Holy Trinity. This is a rare representation, heartily disapporved of by the 16th Century reformers, but it was probably painted over before then. God the Father holds the crucified God the Son between his legs. You can just make out the dove between their heads. This is a survival from the earlier medieval church, but there's not much else. Almost all here is the rebuilding of the late 15th and early 16th centuries. Even as my eyes adjusted this still seemed a gloomy interior, despite the aisles and clerestory, but really, this was just in contrast to the sea of light to the east, where the chancel spreads beyond the chancel arch, another surviving element of the earlier building. The rood must have been a high one. Above the west end of the church sits what many people consider to be the greatest treasure of this church, the organ. It dates from 1674, although the case may be even earlier. It was installed here in 1709, only to be moved into the chancel by the Victorians. In 1969, reunited with its case, which had spent a century in the castle museum, it was returned to its rightful place at the west end. The west end of the north aisle beside it has been reordered as a prayer chapel, which is rather lovely. The west end of the south aisle is a shop, but this is not intrusive. The font sits in the north aisle. It is medieval, but seems recut. Otherwise, the nave was restored sensitively by the Victorians, and retains the feel of a serious urban space which was no doubt intended by the restorers. Beyond it, you step through the chancel arch, where magnificence awaits. Ahead is the altar, and beyond it an interesting altar piece from the time when Laudian piety and the beginnings of the Age of Enlightenment touched fingers for a moment. It is an abstract image of 'Glory', dating from the early 17th century. It is similar to those that can be seen in some Cambridge college chapels (this church was inherited by Pembroke College, Cambridge, in the late 16th century). It did jolly well to survive the Puritan terror. The chancel sprawls into both aisles, a wide open space which is pleasingly full of light. It is a perfect setting for the tombs, which are, of course, what many people come to Framlingham to see. There are six of them, two to the south and four to the north. There is room for many more, which is clearly what the Howards intended. However, one of those to the south is not a Howard at all, which they certainly didn't. The four tombs to the north of the altar are in chronological order from the altar outwards, anti-clockwise. The first is to Henry Fitzroy, one of Henry VIII's many illegitimate children. The most remarkable thing about it is the series of friezes around its sides, depicting scenes from the Old Testament. Next to it, against the north wall, is the tomb of two wives of Thomas Howard, the fourth duke of Norfolk. He was one of those who plotted against Elizabeth I, in favour of Mary Queen of Scots, and his head was neatly severed in the Tower of London as a result. Beside this is a comparitively understated tomb for the infant Elizabeth Howard, daughter of one of the unlucky ladies on the previous tomb. Finally on this side, the most recent tomb is for the fourth Duke's younger brother Henry Howard, an enthusiastic Catholic who was, not unreasonably some might think, executed by the advisors to the boy King Edward VI in 1547. This tomb actually dates from about 70 years later, and is the most spectacular of all of them. On to the south side of the sanctuary, then. The first tomb is the second oldest, and is for Thomas Howard, third Duke of Norfolk and architect of this amazing mausoleum. This man was a lackey of Henry VIII, but it all went pear-shaped after the King's death, in terms of both Henry's and Howard's successors.This tomb may not be as spectacular as some of the others, but it is important as the final statement in England of religious imagery before the Reformation - note the extraordinary series of Saints around the sides. His beard is rather awesome, too. Finally, the tomb of Sir Robert Hitcham, the interloper in this family mausoleum. After the disgrace of the Howards (they just couldn't shake off that Catholicism, I'm afraid), the castle passed through the hands of relatives until Hitcham bought it for a wacking £14,000 in 1635. Unfortunately, he died less than a year later. Hitcham was a great benefactor to the town. Hitcham's castle is now in the care of English Heritage, and may be visited for a small fee. A walk along the curtain walls is exhilarating and recommended. Another famous name associated with Framlingham is Thomas Mills, his name remembered by that of the local High School. He is not here, however. A staunch non-conformist, he lived through the turmoil of the Commonwealth and subsequent emancipation of non-Anglican protestant communities, and was buried in his garden. His estate continues to benefit the town through the Mills Charity. His descendants at Great Saxham have a mausoleum in the church there. I remembered the first time I'd visited Framlingham church some 20 years before, knowing nothing about it, and being pretty amazed by the Howard tombs. There are nothing quite like them elsewhere in the county. If you have been to Wingfield or Dennington, then to come here is to see something quite different - not only had taste and artistic expression changed in the intervening centuries, but perhaps also the way in which England's most powerful and important family could memorialise itself excessively and shamelessly without worrying too much about what God might think. I remembered on that first occasion listening to two elderly American tourists standing beside me as I looked at Henry Howard's tomb. "These Howards thought a lot of themselves," said the lady, "such arrogance!" Her husband considered for a moment. "Perhaps," he replied quietly, "but they had a lot to be arrogant about." I stood for a while, and then walked quietly back westwards into the 19th Century, and out into the blissful sunshine to cycle my leisurely way back to Ipswich. Oh, and in case you are wondering, Andy Murray won the tennis.